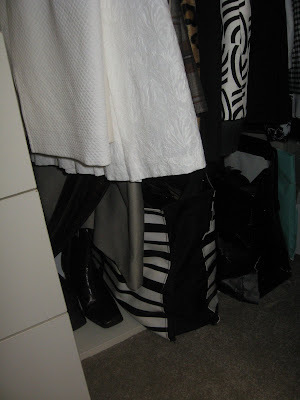 So here's my closet before. It's already pretty organized since I regularly groom it. I find it soothing. Also, for the past 10 years, I've worked with closets that were three feet wide. The discipline required was valuable. Compared to what I had before, this closet feels like a Home Depot aisle. 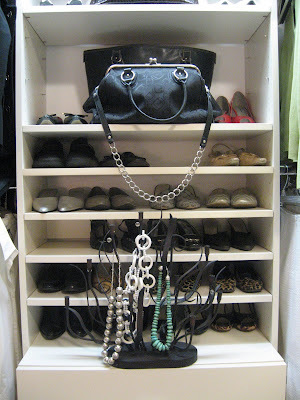 The main changes were decorative, inspired in part by Nicole Balch's closet makover at Making It Lovely. I liked her glass wig head and jewelry tree. 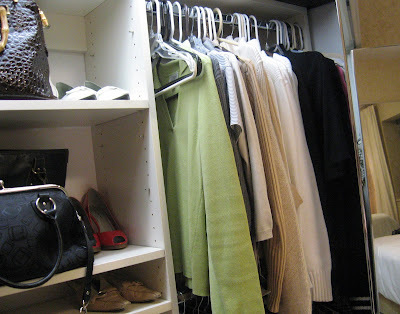 Here are some of the organizational details: I hang clothes first by item then by color, jackets and shirts on one side, sweaters and skirts on the other. Out of season clothes go in the back corner of each section. I have mirrored metal bi-fold doors. 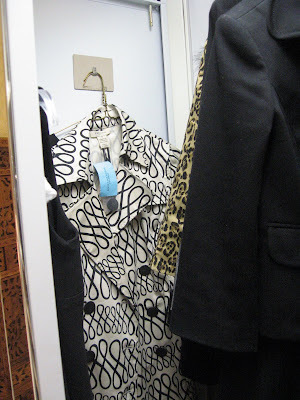 Long items like dresses and raincoats are hung on the back with magnets. Out of season shoes go in pretty shopping bags or beach bags. 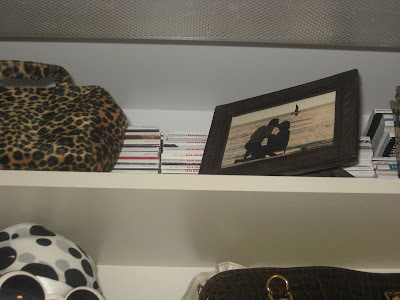 Little purses and my horde of decorating magazines go up top. Belts and jewelry below. I leave the other two dresser drawers mostly empty. After any cleanup, you need to leave some empty space for your dump zone. Otherwise you will dump new things on your closet floor, which is an aesthetic no no. 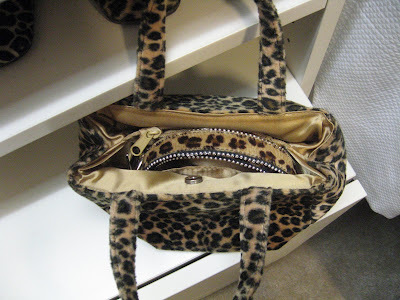 More scarves and belts are stored inside of the purses. 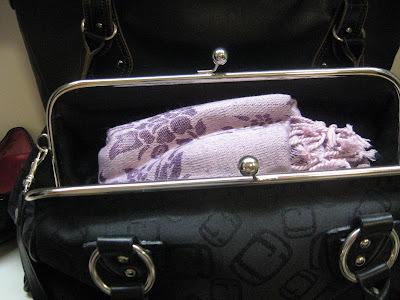 When I'm really organized, the scarf or belt actually matches the purse. OK, now you can get some chips and go sit on the balcony. Any suggestions for closets with regular old-fashioned swinging doors in which most of the storage space is to the right (or left) of the door, behind the wall? That's my challenge right now... besides the fact that we have entirely too much "stuff" and are afraid to throw anything away because of the recession (we might NEED it...). Normally a big no-no, I know, but right now... I'm not so sure. By the way, what do you do with clothes you've worn but don't need washed yet?I find they clutter up my bedroom! 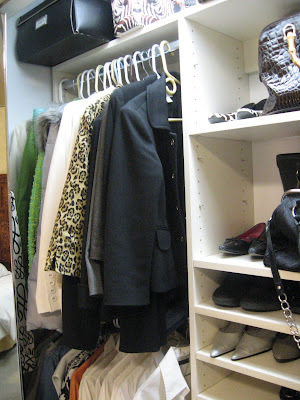 I would make use of the back of the door with an over-the-door hanger for long coats and dresses. 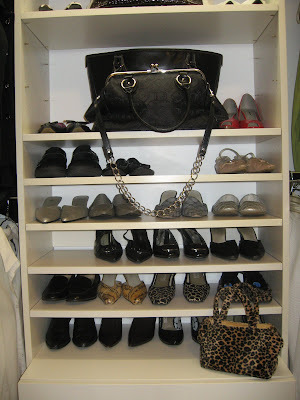 On top of that, I would put generous hanging shoe storage, like this one: http://www.bedbathandbeyond.com/product.asp?order_num=-1&SKU=13423830. I like this size because you can stuff a whole pair of women's shoes in one pocket. On getting rid of things, that's such an interesting issue it almost deserves its own post. Let me think about that. Back in the day, I used to dump the clothes I wore onto a wicker rocker until the pile was four feet deep. Now I hang everything up the moment I take it off. 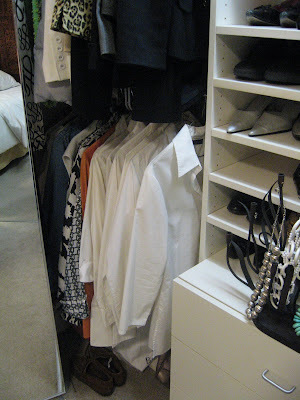 Since I have to get into the closet to get a change of clothes anyway, that's the easiest time to hang up what I had on. Wow, I'm jealous. 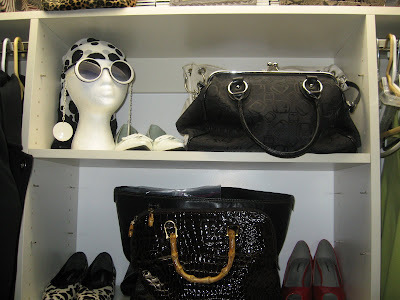 My closet is actually pretty large, especially for an old house (about 6x9/) but it's tucked under the roof so it's only full height at the front and then it slopes down from there. The way it is now is a huge waste of space. I need to move the pole down to half hanging height for shirts and skirts so that I can better use the space. I still can't figure out where I can fit my shoes though. 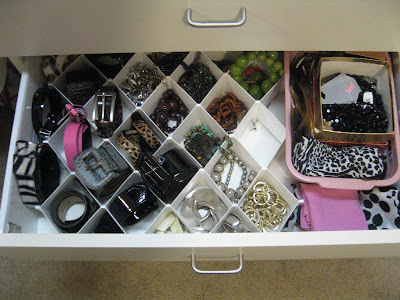 I'd love it to be this organized. Wow! 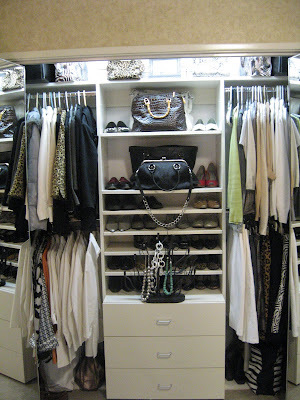 Awesome closet. 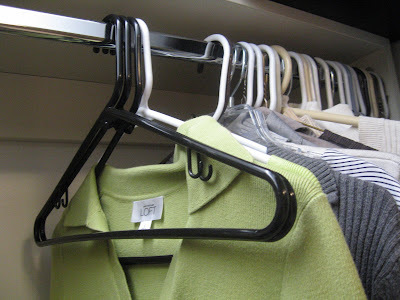 I use Huggable Hangars (but the generic ones from Walmart) and have doubled my hanging space. After looking in your closet, I feel like my clothes need some updating. 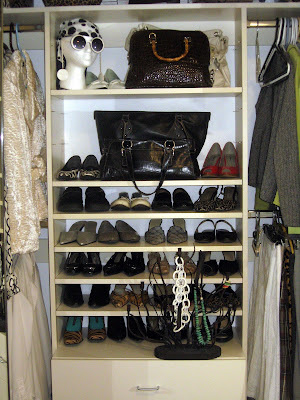 where is your closet from? closemaid... home depot? Sorry Iliana, I don't know. It was in the apartment when I moved in.